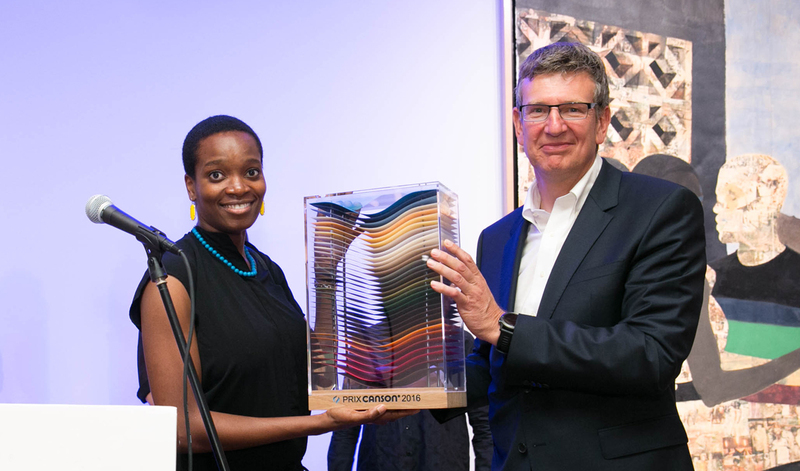 The sixth edition of the Prix Canson Prize, which recognizes achievements of international artists who work with paper as their principal medium, was awarded to Nigerian artist Njideka Akunyili-Crosby in a ceremony at New York’s Drawing Center on Tuesday, June 21. Born in Enugu in 1983, the Los Angeles-based artist creates large-scale works that combine collage, drawing, painting, and photo transfer to weave complex narratives that reflect an abundance of art historical references and images from her own personal archive, as well as from contemporary culture. She is known for exploring a wealth of themes in her pieces such as literature, identity, race, assimilation, and memory, but she specializes in teasing out her own relationship with colonialism and representation as an expatriate working in the US. Out of the five nominees for the Prix Canson, four were women, three of which were women of color. The artists shortlisted for the prize were Ruby Onyinyechi Amanze, Bethany Collins, David Shrigley, and Lucy Skaer. An exhibition of the works of Akunyili Crosby as well as the four finalists will be on view until July 1. Each year different institutions act as hosts of the award, this is the first time it has been presented in the United States. It has previously been held in Paris (2015) and Barcelona (2014). Akunyili Crosby will receive over $11,000 of Canson paper and an invitation to be part of a residency that was established by artist and former president of the jury, Tunga, who recently passed. Don't miss interesting news by joining our newsletter. TheEasterner.com.ng is a medium for tracking news and opinions of the East of the Niger. It is a response to the growing demand for a one-stop online destination for stories of the East.